Tomorrow, Kansas State University will hold their campus-wide Open House event which will serve as an opportunity for colleges and departments to showcase their students abilities. In the College of Architecture, Planning, and Design, the Interior Architecture + Product Design students are more than happy to show people what they do all day (and night) in Seaton Hall. 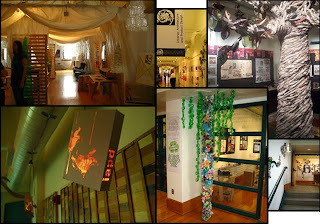 Third-year IA+PD students are in-charge of the theme, design, and set-up of the department's display, not just voluntarily, but also as a part of a course grade. 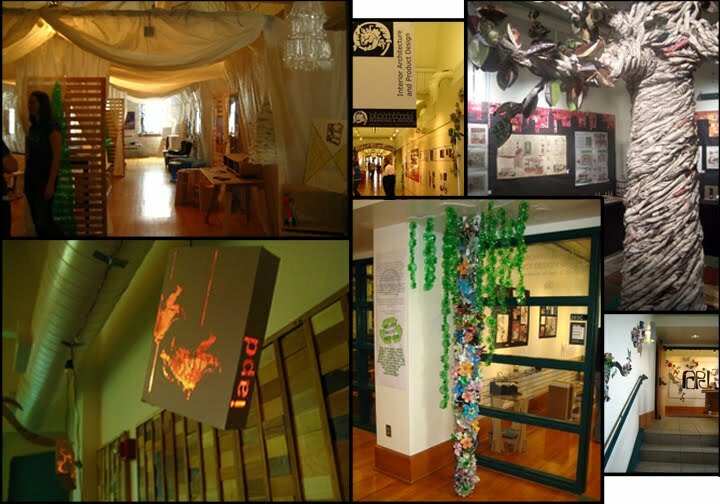 The main challenge was the shoe-string budget which propagated the issue of resources and materials for displays. The 2011 class of IA+PD students, who were in charge Spring 2009, came up with a solution that sits very close to PlanetReuse's heart: recycling. Since the students had minimal financial savings for the project, this forced them to think completely outside of the box. In the CAPD, the volunteer-run recycling service set up for every studio collects aluminum, paper, cardboard, plastic, and glass solving the problem of available resources. The next task became the overall scheme for where the materials were to be placed within the four display areas. The scheme became Seasons of the year and each "season" corresponded to a specific "material." To help unify all four areas, every room/season housed a tree made out of its' corresponding material. In the Spring area, plastic bottle top flowers covered the walls and various chandeliers made of the bottle ends were hung as-needed. Snaking vines from the flowers, constructed of paper and aluminum, helped guide people from one season to the next. Paper or Summer was home to one of the more popular elements; the recycled newspaper tree. On the walls surrounding this 8' tall by 2' wide monster was a city skyline backed with a color-spectrum sunset of recycled magazine pages. Projection screens and computers in Autumn, or the cardboard area, were dimly lit by cardboard-box lanterns with CNC/hand-cut designs. The final season, Winter, was the plastic room. For most elements, the "flattening" of recycled bottles was necessary which included cleaning, cutting, removing the label, and ironing each bottle to produce a flat, use-able material. Once the laborious steps were completed, the material could be used to create elements such as icicles or plastic bottle evergreens which were strung with fishing wire from the ceiling. The recycled-silverware chandelier was a popular Winter item and was salvaged afterwards for use as an accent-light in their classes studio space. As a consequence of dwindling funds, this group of creative-thinkers came up with more than one use for fellow studio-mates recyclable waste! If you plan on attending the K-State Open House tomorrow, be sure to swing by Seaton Hall to see what the IA+PD students have up their green-sleeves this year!